An Angolan man who died after being restrained by three G4S guards as he was being deported from the UK was unlawfully killed, a jury has found. 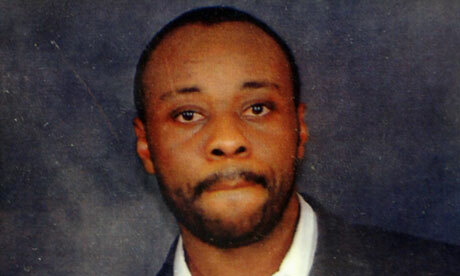 Jimmy Mubenga, 46, died on board a plane at Heathrow airport that was bound for Angola in October 2010. At the end of an eight-week inquest, a jury of seven men and three women recorded a majority verdict of nine to one of unlawful killing after four days of deliberations. The Crown Prosecution Service said it would reconsider its original decision not to bring criminal charges in the wake of the verdict. Returning the verdict of unlawful killing, the jury foreman said: “Based on the evidence we have heard, we find that Mr Mubenga was pushed or held down by one or more of the guards, causing his breathing to be impeded. We find that they were using unreasonable force and acting in an unlawful manner. The fact that Mr Mubenga was pushed or held down, or a combination of the two, was a significant, that is more than minimal, cause of death. The inquest heard that as the plane began to taxi on to the runway the guards said Mubenga became tired and stopped shouting. The guards said they realised something was wrong and the plane returned to the stand and paramedics were called. Mubenga was pronounced dead a short time later. In evidence, the guards claimed they had not heard Mubenga saying he could not breathe and insisted he had been resting his head on the seat in front and intermittently forcing it down towards his knees as he was being restrained – a position known to carry a risk of death by asphyxia. But counsel for Mubenga’s family, Henry Blaxland QC, suggested to Hughes that the guards had been trying to “teach Mubenga a lesson”. He said the three guards had been pushing Mubenga’s head down in an attempt to keep him quiet and had only “come up with” the story that Mubenga was forcing his own head down to explain what passengers on the plane would have seen. The inquest heard the three guards were subsequently arrested “on suspicion of criminal offences” relating to Mubenga’s death, but last year – 21 months after his death – the CPS decided not to press charges and no further action was taken. During the hearing it emerged that two of the guards – Hughes and Tribelnig – had a string of racist “jokes” on their phone. Hughes’s phone had 65 texts containing what the coroner Karon Monaghan QC said contained “very racially offensive material”. A G4S spokesman said: “The death of anyone in our care is deeply felt by all of us and the death of Mr Mubenga was a very tragic event. “The welfare of those in our care is always our top priority and we take great care to ensure that our employees on this contract, which has been carried out by another provider since November 2011, were made aware of their responsibilities in this respect. Our employees were also trained, screened and vetted to the standards defined by strict Home Office guidelines. “We believe that at all times we acted appropriately and in full compliance with the terms of our contract with UKBA and it should be noted that the Crown Prosecution Service found no basis on which to bring criminal charges against G4S in this case. There has been widespread concern about the way people are removed from the UK, with repeated allegations of mistreatment and assaults of detainees. The contract is now run by Tascor, and current guards who have spoken to the Guardian say there is still inadequate training for new recruits. One who did not want to be named said a number of detainees had been punched and assaulted by guards on a recent charter flight to Lagos. A spokesman for Tascor said it could not comment on anonymous claims, but added that it focused on “delivering a professional service to its clients while ensuring its methods of operations are compliant with the relevant statutory regulations”.